In a city like London, where architecture from many centuries past sits among modern skyscrapers, a show like the London City Concours that unites great cars old and new seems perfectly at home. I visited the event this summer on a break from Japan. It was the first event of its kind, and as inaugural shows go, this one was pretty awesome. Hosted in the gardens of the Honorable Artillery Company (HAC), it’s right in the heart of the UK’s capital. There’s no need to drive all the way out to the countryside to attend this event. That not only makes it convenient but all the more appealing. Think of it as London’s version of The Quail, Villa d’Este, or Amelia Island. It’s a place where enthusiasts of the rarest and most exclusive cars come together to get up close and personal with these cars, and if you have the cash, make an offer to buy some of them as well. Getting there was easy, just a short trip on the Underground then a short walk from the nearest station (Old Gate) to what looked like a castle. Being hosted at the HAC, there’s quite a lot of security around. That’s no bad thing considering the value of cars housed inside. The show itself was quite small, though that’s to be expected for an inaugural event. Around 80 cars were on display ranging from examples from as early as the 1900s to the modern day hypercars. Most of the cars came from private collections and had never seen the light of a car show until now. The rest were from premium car dealers. They were displayed on the five-acre lawn on the grounds of the HAC with a mix of modern and old buildings, apartments, and office spaces surrounding the cars. A nice little reminder that this city in indeed one where the past meets the present and the future. The cars were displayed in different classes. There was the “Evolution of the Supercars Parts 1, 2, and 3", showcasing supercars from the 1950s to present, starting with the Mercedes 300SL. Some people dispute this as the grandaddy of supercars, suggesting the Lamborghini Miura was the first proper supercar, but there wasn’t a Miura at this show so the 300SL will have to suffice. Part 2 included neo-classic supercars from the ‘80s, ‘90s, and 2000s. 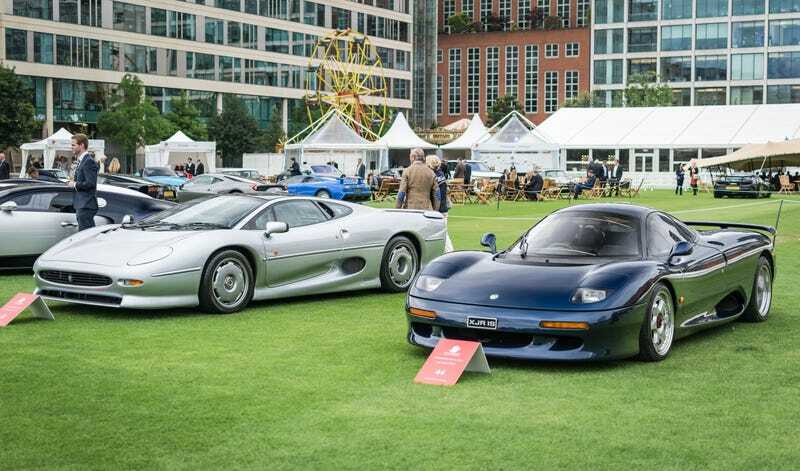 Cars such as the Ferrari 288 GTO, Jaguar XJ220, and the Bugatti Veyron were on display, showing the vast changes supercars have gone through in just a few years. They also had a Maserati MC12, Bugatti EB110, and Lancia Stratos. Finally, Part 3 had cars we’re all familiar with today such as the hybrid hypercars, the Pagani Huayra, and the insane Aston Martin Vulcan. Each represents the current peak of where motoring evolution stands. These cars were displayed at the end of the lawn, sort of culminating in a sort of historical walk of the evolution of the supercar. Older cars on display included a 1903 Daimler 14 HP Tonneau Tourer, a 1912 Rolls Royce Silver Ghost London to Edinburg, and a 1927 Bentley 3L Speed Wayman, only 15 of which were produced. For some glamour, “The Swinging 60s” class didn’t disappoint with cars such as the Ferrari 275, Alfa Romeo GTV, and Jaguar E-Type. The “Joy of the Road” section was joyous indeed with a Porsche 356, Ford Mustang GT350, and Maserati Vignale Spider 3500 on display. “The Collector: American Muscle” showed some of the rarest and most pristine condition American classics in the UK from a single collector. The collection included in a 1966 Dodge Coronet Deluxe Hemi Police Special, a 1969 Plymouth Road Runner 440 6-Pack, a 1969 Dodge A12 Super Bee, a 1970 Chevrolet El Camino SS, a 1970 Dodge Challenger T/A 340, and a 1970 Plymouth Barracuda. If that’s not enough, other sections had a Maserati MC12 Corse, Jaguar D-Type Long Nose, and a Ferrari 365 GTB/4 Competizione. Coincidentally, three of the cars were from Japan. After going around and seeing all the cars there was a lack of other activities to do. Certainly, it seemed like a show that could be done and covered within a couple of hours and didn’t need to be spread out over two days. Perhaps having a schedule of activities throughout the days would be the next step to making this show grow in the future. As great as it was to appreciate these rare and wonderful cars on the picturesque lawn there wasn’t much else to do other than sit around. Plans for a show next year have already begun. It might not be as big or as grand as the established concours shows, but it certainly has potential given the impressive turnout for its inaugural event.